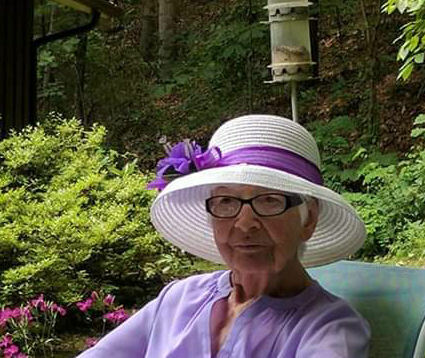 Waynesville, Gabrielle "Gaby" Deschamps Lowell, died on Sunday, March 31, 2019 at Silver Bluff Nursing Home & Rehabilitation Center. Gaby was born June 30, 1923 in Lier, Belgium. She was a daughter of the late Antoine and Marie Deschamps. In addition to her parents she was preceded in death by her siblings, Mariette and Antoine Deschamps; husband and father of her children, Richard C. Thompson; son, Richard G. Thompson; and husband, Steven Lowell. Gaby began her nursing career in 1969 in Miami and Lakeland, Florida until moving to Waynesville in 1982. She worked many years as an R.N. in I.C.U. at Haywood County Hospital. Gaby loved gardening, cooking, needlework, reading and caring for her family and friends. She was a member and elder at Providence Church. She served on the missions committee and was always willing to help in any way from the nursery to the kitchen. In her last months of life her greatest joy was attending Sunday worship. She is survived by her children: Vicky Barnes (Larry) of Bartow, Florida, Toni Cook (Wally) of Waynesville, Karen Taylor (Jerry) of St. Augustine, Florida; daughter-in-law Audrey Thompson of Nashville, Tennessee; 14 grandchildren, 32 great-grandchildren and 8 great-great-grandchildren; cousins Jenny Tholembeek and Anne Radack of Atlanta, Georgia. A celebration of life will be held at 10:00 a.m. on Wednesday, April 3, 2019 at Providence Church, 1400 Old Clyde Road, Clyde, NC 28721. In lieu of flowers, memorials may be made to Providence Church.